I've written about floating books on this blog before (Lippincott bill of lading and The MV Doulos), but here's a new twist on the concept: a floating book barge. I found this on the blog of a London bookseller/poet, Jen Campbell, and though I don't have any related paper ephemera to display, the digital counterpart (i.e., Web site) is too interesting not to post: The Book Barge of Lichfield in Staffordshire, England. Before disembarking (or is that disembarging? ), be sure to have a look at the Ship's Log. 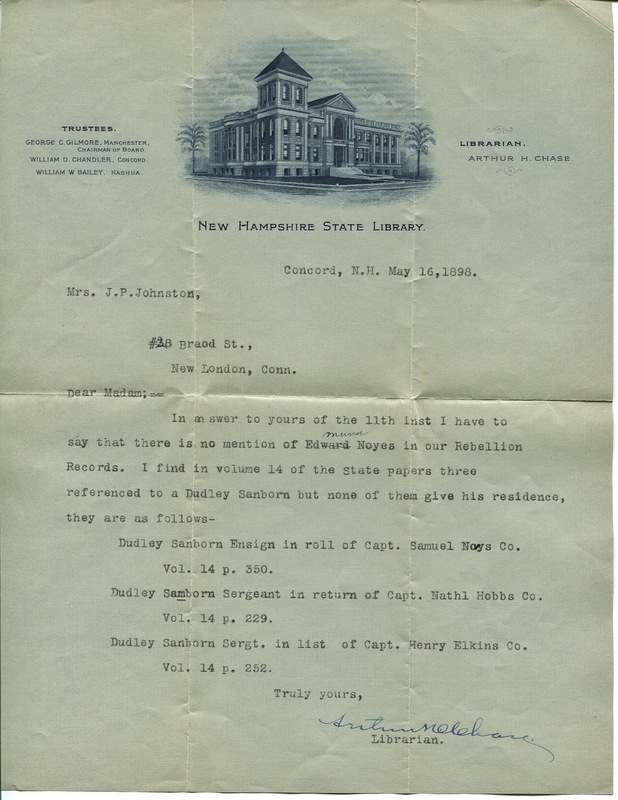 Here is a typed, hand-signed letter from Arthur H. Chase, Librarian at the New Hampshire State Library, in Concord, NH in 1898. 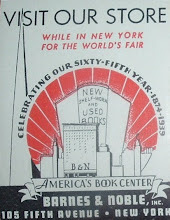 The library letterhead includes a nice image of what the building looked like at that time. I found recent images of the library at the Web site for Meridian Construction, who did an extensive renovation on the building in 2009. The Web site included photos, as well as text, to document the changes. You'll notice that the upper-floor tower has been removed, but that may have happened well before the recent renovation project. Of Arthur H. Chase, I have very little information. His name pops up numerous times in Internet searches, but usually associated with library bulletins and reports that are in the archives. So even though there's not a lot to write about, I just liked this letter for its design (color and illustration) and origin. 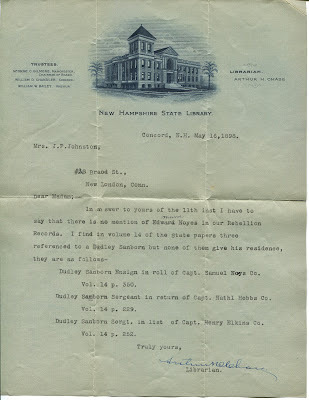 New Hampshire figures prominently in my family history. And it appears that family history was the subject of this letter, which leads to another observation about this letter. Mr. Chase was writing to answer a query for information on a certain person from New Hampshire who served during the War of the Rebellion. South of the Mason-Dixon line, you might hear it referred to as the War of Northern Aggression. We all know it as the Civil War. But Mr. Chase had no luck searching for an Edmund Noyes in the state library's records on the Rebellion. This kind of correspondence from more than a century ago underscores the power of the Internet and the Information Age we live in today, which many of us probably now take for granted at times, if not all the time. A few taps on the keyboard and a few mouse clicks will produce a lot of material to study on an Edmund Noyes from New Hampshire who served during the Rebellion. Librarian Chase may well have spent the better part of a morning or day retrieving the records in his library and searching through them. I suspect Arthur H. Chase would be pleased to see how far library science has evolved as much as he would enjoy seeing how little his old library building has changed in appearance, minus that tower of course. Sir Thomas Phillipps (1792-1872) was an ardent bibliophile, collector, cataloger, publisher, and intense sufferer of bibliomania. In the title of this post, Bart. refers to Baronet, a hereditary honor by the British Crown. 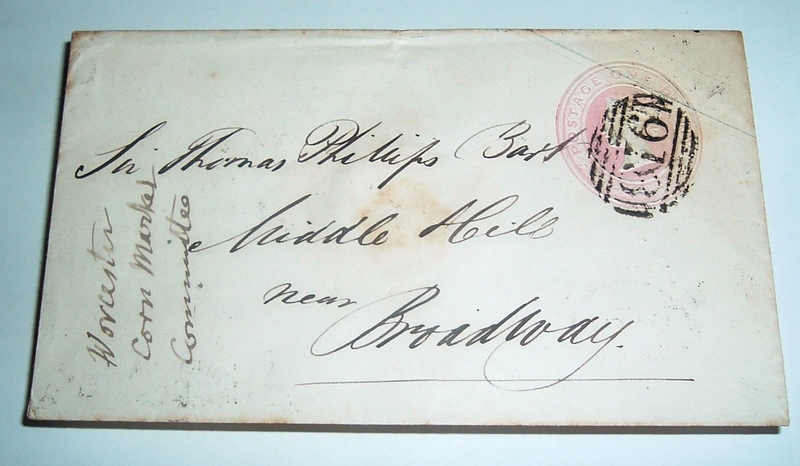 Phillipps once aspired to collect every book and manuscript ever written. In his attempt to do so, his estate, Middle Hill, was full to the gills in every room with the objects of his obsession. So immense and staggering was his collection, it took well more than a hundred years after his death to disperse all of it through auctions and private sales. Today, Phillipps might be characterized as a hoarder. 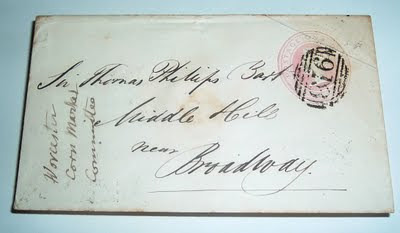 In 1848, he received this envelope below, opened it, and read its contents, possibly book or manuscript related. 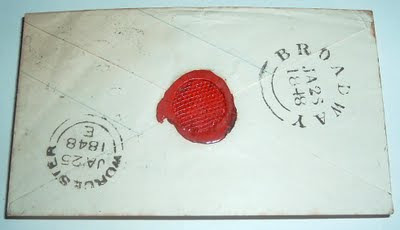 Somewhere along the way to present day, the contents became separated from the envelope. There's no telling where the letter went, but the envelope found its way here. 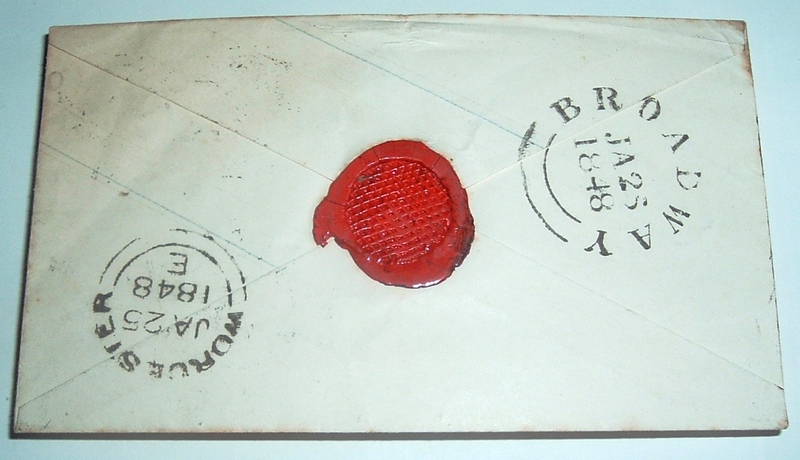 The letter, with wax seal still present on the back side of the cover, was posted January 25, 1848 at Broadway, where Phillipps resided at Middle Hill. He had inherited this estate from his father, but it was his own heir that would cause him to one day abandon Middle Hill. In 1863, out of fear that his daughter and son-in-law, whom he disliked, would inherit Middle Hill (dictated in his father's will) and all his books, Phillipps simply moved into a new estate, which his heirs could not touch. Moving such a massive amount of books reportedly took two years to accomplish. 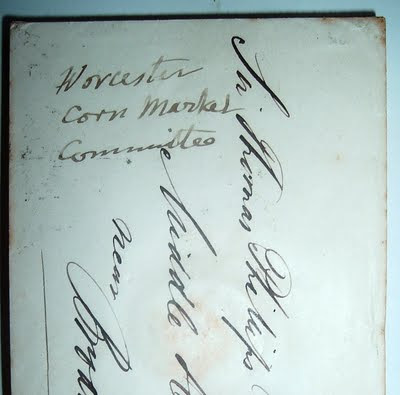 Broadway, the village in which Phillipps amassed most of his collection, is about 15 or 16 kilometers (about 10 miles) southeast of Worcester, which is referenced on the envelope with the writing, Worcester Corn Market Committee. I don't know if this is something that Phillipps was involved with or if he may have even made the notation himself. Maybe the letter was from the committee. Perhaps the answer to the Worcester Corn Market Committee mystery is in A.N.L. Munby's five-volume study on Phillipps, a copy of which is not in my collection. Yet. 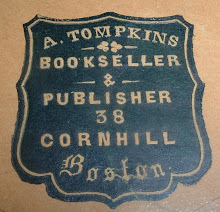 I recently discovered The American Book Collecting blog, in which Kurt Zimmerman writes entertainingly and enthusiastically about his collection: Books about American book collecting. He also collects books about Latin American literature, but this blog focuses on American book collecting. 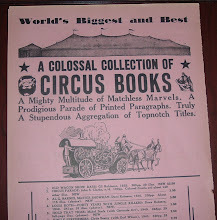 What makes this blog particularly interesting to me is the ephemera that complements the books in his collection. 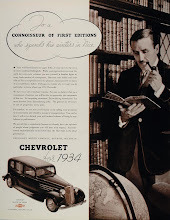 Without that, the blog is still fine reading, but I have an affinity for the ephemeral pieces and thoroughly enjoy both in this bibliophile's paean to books and book collecting.